In a major address last month on his plans to deal with climate change, President Obama said he would give his approval to building of the Keystone pipeline “only if this project does not significantly exacerbate the problem of carbon pollution.” Since then, lobbying continues to be fierce by supporters and opponents of the 1,700-mile pipeline that would carry Canadian oil from Alberta to refineries on the U.S. Gulf Coast. A Pew Research Center survey conducted in mid-March found that 66% of Americans favored building the pipeline while 23% opposed doing so. Support for the pipeline cut across partisan and demographic lines. 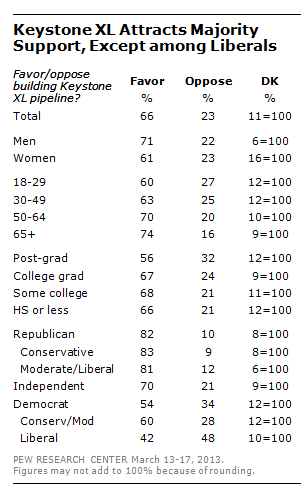 Substantial majorities of Republicans (82%) and independents (70%) favor building the Keystone XL pipeline, as do 54% of Democrats. Among Democrats, 60% of party moderates and conservatives support the pipeline compared to 42% of liberals. The finding comes at a time when most Americans believe in evidence of global warming but disagree about the causes. About seven-in-ten (69%) say there is solid evidence that the earth’s average temperature has been getting warmer over the past few decades, about the same number expressing this view last year. Unlike views on Keystone, there is a partisan gap on this question: 87% of Democrats believe there is solid evidence of global warming compared with 44% of Republicans.